Runway Numbers » OPShots.net - Cyberhub to Cleveland Aviation and the World! Why are runways numbered, and what do the numbers mean? Runways are numbered according the magnetic compass direction they are oriented to. They consist of two numbers, one at each end of the runway, each being the reciprocal of the other on the magnetic compass (180° opposite from each other). One number is formed by rounding the compass bearing of one end of the runway up or down to the nearest 10° and dropping the last digit; if this results in a single digit, add a zero to the left of it. The other number is the reciprocal of the first number (see the table of Reciprocal Runway Numbers below). 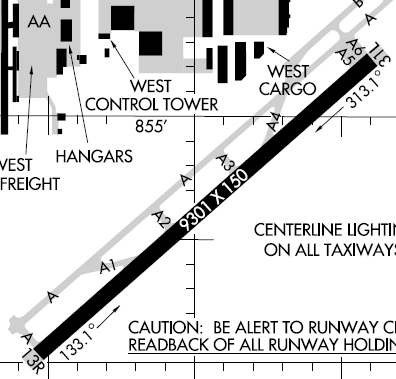 For example, if a runway is aligned north-south, then it is 18/36, not 00/18. The lower number is always listed first. Runways have two ends. Each end is considered a different runway, even though it is the same actual runway surface. If the compass heading of a runway is 122° you would round it down to 120 and drop the last digit, leaving you with 12. Thus it is called Runway 12/30. If the compass heading of a runway is 57°, you would round it up to 60 and drop the last digit, leaving you with 6. Since this is a single digit, you add a zero to the beginning, giving you 06. Thus it is called Runway 06/24. Both Hopkins and Burke Lakefront airports have pairs of 06/24 runways. 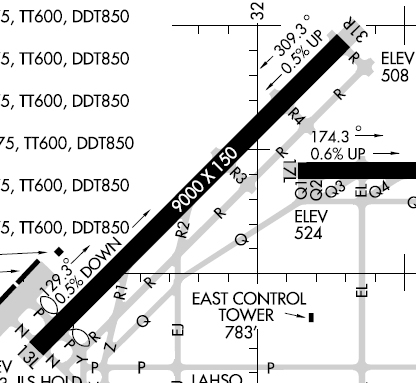 For example, in the runway diagram below, this is considered runway 06L/24R. If you are looking to the northeast, you are on runway 06L, if you are looking to the southwest, you are on runway 24R. 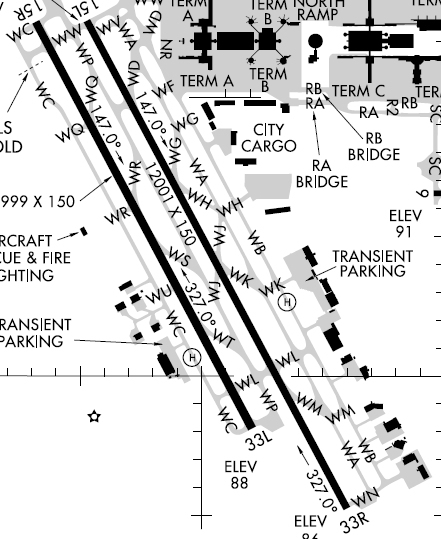 This is an excerpt from the KCLE airport diagram. It shows the layout and connecting taxiways for Runway 6L/24R. The actual magnetic bearing you would see on the compass when sitting on the runway facing northeast is 057.7°, and if you did the same on the other end, facing southwest, it would be 237.7°. When an airport has multiple parallel runways, they will all be oriented the same direction. When this happens, they assign a letter, either L, C, or R to the runway number. When airport designers first develop the plan for an airport, they look at historical weather data, mainly what direction the wind is blowing the majority of the year, and design the airport runway layouts to favor this. For the examples used above in Texas, the wind is usually out of the south (approx. 160° to approx. 170°), so most airports in the Houston area will have their main runways running north / south. There will usually be other runways oriented in some east / west direction, again, as dictated by historical weather patterns or as dictated by local building restrictions, city planning, etc.